Amanda Lang: Is it really worth it to support Bombardier? 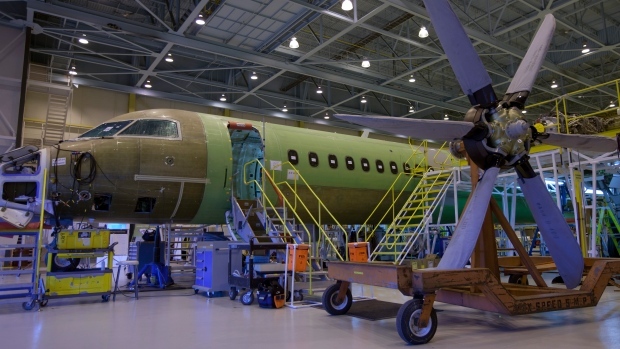 Bombardier Inc. (BBDb.TO) is slashing 5,000 jobs – mostly in Canada -- in the latest phase of its ongoing restructuring. The Montreal-based plane and train maker announced the cuts early Thursday, saying they're designed to "lean out and simplify" the company's corporate structure. A spokesperson for Bombardier confirmed in an email to BNN Bloomberg that approximately 3,000 of the job cuts will happen in Canada. The overall restructuring is expected to take place over the next year and a half and will save the company US$250 million per year. Bombardier also announced it will sell its business aircraft flight and technical training unit to CAE, and will also sell its Q Series turboprop aircraft program to Longview Aviation Capital, for anticipated total proceeds of US$900 million. And the overhaul might not be over yet, with Bombardier saying it’s exploring strategic options for its CRJ regional jet program. Shares in Bombardier fell more than 17 per cent to $2.64 as of 1:25 p.m. ET Thursday. “With our heavy investment cycle now completed, we continue to make solid progress executing our turnaround plan. With today’s announcements we have set in motion the next round of actions necessary to unleash the full potential of the Bombardier portfolio," CEO Alain Bellemare said in a release. Bombardier has been in a multi-year overhaul under Bellemare’s stewardship, with multiple rounds of job cuts and waves of asset sales in recent years. Most notably, the company sold control of its crown jewel, the CSeries jet program, to Airbus in a deal that closed on July 1. Along the way, it’s also received support from various levels of government. In February 2017, the federal government said was providing $372.5 million in loans over a four-year horizon to “support thousands of good middle-class jobs.” And in June 2016, the Quebec government closed a US$1-billion investment in Bombardier’s then-wholly owned CSeries program. “Over the years [Bombardier has] just been a money pit, wrapping itself in the flag – be it the Canadian flag or the Quebec flag,” said Norman Levine, managing director at Portfolio Management Corp., in a conversation with BNN Bloomberg on Thursday. The company also reported third-quarter results on Thursday, with quarterly revenue falling five per cent year-over-year to US$3.64 billion and an adjusted profit of US$0.04 per share. Analysts, on average, expected US$3.87 billion in revenue and a profit of two cents per share. Quarterly cash burn decelerated to US$370 million in the period; however, the company put investors on edge by saying it will only be able to hit its 2018 cash flow forecast by including proceeds from the recently-announced sale of its Downsview site in Toronto for US$635 million. On the back of the restructuring announcements, Bombardier unveiled financial forecasts for 2019, with the company warning it could burn through up to US$250 million. It's also aiming for at least US$18 billion in revenue and up to US$1.8 billion in adjusted earnings before interest, taxes, depreciation and amortization (EBITDA).